​Organically farmed food has a bigger climate impact than conventionally farmed food, due to the greater areas of land required. This is the finding of a new international study involving Chalmers University of Technology, Sweden, published in the journal Nature. ​The researchers developed a new method for assessing the climate impact from land-use, and used this, along with other methods, to compare organic and conventional food production. 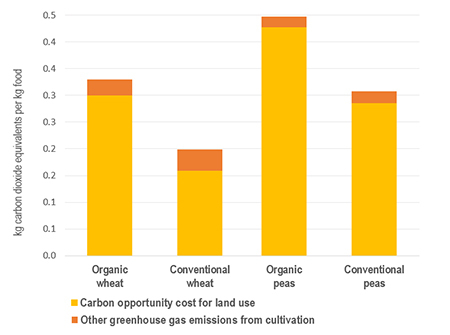 The results show that organic food can result in much greater emissions. The crops per hectare are lower in organic farming, which leads to greater indirect carbon dioxide emissions from deforestation. “Because organic meat and milk production uses organic feed-stocks, it also requires more land than conventional production. This means that the findings on organic wheat and peas in principle also apply to meat and milk products. We have not done any specific calculations on meat and milk, however, and have no concrete examples of this in the article,” he explains. Stefan Wirsenius, Associate Professor at the Department of Space, Earth and Environment.